Motorola's growth impressive, and comes from 1m linux-based units shifted in China and some Q in the US, Sharp's from 1m FOMA in Japan. "Handhelds" (Palm, Ipaq etc) continue to drop. Suspect that svn hosting is in there too. "If they can't adapt it to the way they need to work, they simply won't bother using it. They can always get the job done some other way, maybe using their discretionary spending limits to sneak non-standard systems and applications in"
Headshift :: What form will Enterprise 2.0 take? "like a fast version of Risk"
Book Review: Koerner's "Caspar David Friedrich and the Subject of Landscape"
A weird tourist guide. Previously did the Barcabook. Not maps but pictures, geo-coded. Reviewed by Amartya Sen: The White Man's Burden: Why the West's Efforts to Aid the Rest Have Done So Much Ill and So Little Good by William Easterly. Six vendors offering hosted mobile-email *and* email: RIM's hosted BES offers only the mobile-email component. If (a big if) "a sophisticated people may have lived in the Kimberley region of NW Australia as long as 60,000 years ago, before being wiped out by the aborigines" then the drawings would predate Chauvet etc. Tom Hume confirms Innaworks/mBooster magic for optimising j2me apps. Better than the o/s ProGuard. "The people on strike want civic recognition, or a better quality of work life; they are on strike for narrative." "After you write a bit, you find out what you're good at and you focus on that. I also found out that I didn't mind being alone, writing for eight to 10 hours a day." 'This is quite simply the biggest contemporary art fraud the 20th century has seen. It was brilliantly carried out.' Now straight and out of pris, Myatt's copies are painted in Dulux paint and KY jelly. Kimmage hasn't cracked on this year's Tour yet: "'That’s what they give you for finishing the Tour de France,' you reply. 'Cool,' he says. 'Where did you finish?' 'Paris,' you smile. 'No, I mean what place did you finish?' 'I finished,' you reply." "Activists' backlash expected as number of experiments rises to 2.9 million" - and any such efforts will continue to incentivise medical research to go abroad, where animal welfare will certainly be lower (UK's regualtions are the tightest). "Eric Gill's reprehensible private life would doubtless land him in prison today. But does that mean we should value his sculpture less? After all, writes Fiona MacCarthy, the two sides of the man are inextricably linked"
Stuckists used FOI act to expose Tate acting illegally (says the Charities Commission) in buying Ofili paintings for 700k whilst he served as a trustee. "Ugly, obscene and terrifying - the grotesque figures in Francis Bacon's paintings disturbingly evoke the claustrophobia and voyeurism of Big Brother, writes Gordon Burn"
a one day publishing fair profiling independent publications produced by writers, artists and musicians. 30th July at Rochelle School on Arnold Circus, Shoreditch, London E2 7ES. Taster of the History of Bombing book. "Dejeuner was refused by the Salon in 1863 and exhibited under the title of Le Bain at the Salon des Refusés [...] Manet himself changed the title of his painting to Le Déjeuner sur l'Herbe at his exhibition of challenge and protest in 1867"
Funny. Fountain (a water feature). Large Glass (greenhousing). Rrose. Keep your passport safely hidden by making own colour copy for use where a scary context asks for id. Q's BOM: $158 before MS licenses etc, sells for c$200-$350; BlackBerry 8700's BOM: $123 (shows in the build quality? ), lacks camera or video/music, sells for c$300. (Nokia E61?) Would be interest to see return rates too. Amazon S3 storage as a general, arms-length utility storage. "Jaiku is a phone book that displays the real-time presence and location of your contacts." "lets users access the entire corporate phone directory, indicate status (in a meeting, unavailable, and so forth), and request callbacks indicating subject and priority" See also the consumer jaiku. Like a cross between Clippy the helper and an in-the-background OTA configurator. Mobile Enterprise: Will Hosted BES Get RIM into SMB? "If companies are to reap the full benefits of virtualization, developers will need to change the way they write code"
Analia Studio AS2005-005 (Detail).jpg on Flickr - Photo Sharing! Brown hasn't (yet?) given Reid the funding for the extra 8,000 prison places. 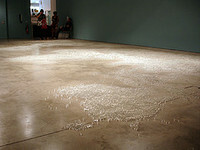 Mona Hatoum's Map (1999) comprises a lot of clear iris-sized glass marbles arranged in clusters on the concrete floor to form a large map of the world. The projection looks like a Mercator, and you walk round it on two sides, west and south, which puts it in the orthodox North-is-up orientation. The patterns of light, often where the marbles are stacked two-deep, hint at geo-political boundaries, but there are no labels, nor is there any political colour-coding. The show's booklet says: "Precariously balanced, fragile yet potentially dangerous, Hatoum's work powerfully suggests the contingency that defines the geo-political landscape". Or: the map is pre-political, pre-historic, showing continental land in a ghostly, glassy white, and the sea is polished grey-brown concrete. Looking at it, you forget everything else in the room. The problem is that until you see it, the map is actually quite easy to miss: at first glance your eye goes straight to some bright photos on the wall. Not noticed by the invigilator, and not noticing that he's entering the map's space, a man strides across the Pacific and his foot crunches down on the Western seaboard of South America. It's a natural disaster for the people of Northern Chile and Bolivia. The UN prepares relief flights in helicopters made of tiny glass beads. It's also a disaster for the marbles -- they aren't stuck down. A ripple propagates through South America, nudging Brazil, and there's a spray of marbles rolling back into the Pacific from the impact site. The invigilator yelps, and trots over to brush the marbles roughly back into shape. The man looks at his trainer as if it has betrayed him. the map was very fragile: as soon as one set foot on the parquet, the marbles on the floor started moving. At the same time, the work was very menacing. I like it when things are attractive and forbidding at the same time; both seductive and dangerous. The marbles made the floor hazardous, because you could slip on the glass balls and fall down. 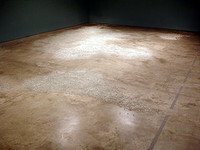 I've done quite a few works which destabilize the ground you walk on. Five minutes later, the invigilator explains to a woman that she's about to do the same. She stops in time, and looks down at the Pacific where she sees a few marbles scattered about, one here, a pair over there. She pauses for a couple of seconds. She assumes that they're stray outliers that have accidentally rolled away from the pack, rather than say, dutifully representing French Polynesia, because she helpfully sweeps them with her foot, tidying them towards South America. More yelping from the invigilator (and the UN wrings its hands over a most unlucky region). Even though it would only be clear to cartographers whether this marble is accurately placed to represent Vanuatu or not, the standard is to assume that things in galleries are deliberately placed. Look don't touch. But perhaps it's not just a matter of an almost-camouflaged field of delicate material, or of the inherent manipulability of maps. It could also be the materials. Marbles are for play, for throwing. They're built to be rolled. The feel in the hand, the clacking sound they make, the flashing light as they roll - all make us want to throw them. And so, faced with marbles at her feet, her body reacted involuntarily sending them flying. A designer might say that marbles afford play more than they afford representation. Perhaps Hatoum is telling us that the world needs play -- the fluidity of happy give-and-take -- more than it needs the enframing, classifying, ossifying urges of cartographers and bureaucrats? There is a growing history of accidental iconoclasm: in 2001, Damien Hirst's Painting-By-Numbers was binned by a cleaner. Usually it's the cleaners, but I would imagine they're just trying to do and keep their job, rather than being the front-line for some shadowy cultural hygnenism dedicated to homogenising the art experience. I wonder if a cleaner has ever tried to casually swing one of Gary Hume's bronze bin bags into a skip.